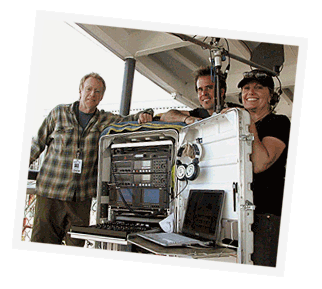 For Art Rochester, veteran sound mixer for American Graffiti, Cellular, and Poltergeist, the water-tight design and rugged dependability of the Lectrosonics MM400B miniature transmitters and ultra-compact, splash-proof SM transmitters has been a lifesaver, film after film. "We have a lot of rain in Déjà vu, our latest movie, as well as some boat chases," he says. "I use the Lectrosonics systems to send information to and from the actors on the boats, and they've proven very durable in these situations. "Because we're in distant locations most of the time we don't have the opportunity or luxury of replacing gear. Therefore we need a microphone system that's so reliable it won't break. When we were filming Master & Commander on the far side of the world - like the Galapagos Islands - we couldn't afford breakage or unreliability, so we chose Lectrosonics. When you're expected to get every word of every take, there's no room for error." Tell us your “Not Fragile” story and get some Lectrosonics swag! The Gnarly Files are now the “Not Fragile” stories, and we want to hear your experiences with our products that have taken a beating and still produced great sound. If we use your story, we will mail you something cool from Lectrosonics. We look forward to adding your stories to our archives of quality product stories.